You’ve probably heard the story about Van Halen and the Brown M&M’s. 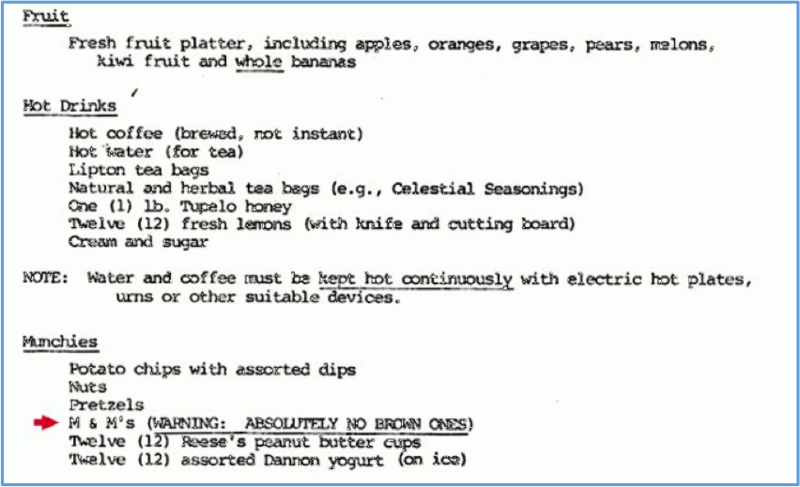 Before every concert, the legendary rock group required a bowl of M&Ms backstage, explicitly demanding “NO BROWN M&M’s.” These requirements were listed in the middle of lengthy Rider to their performance contract. 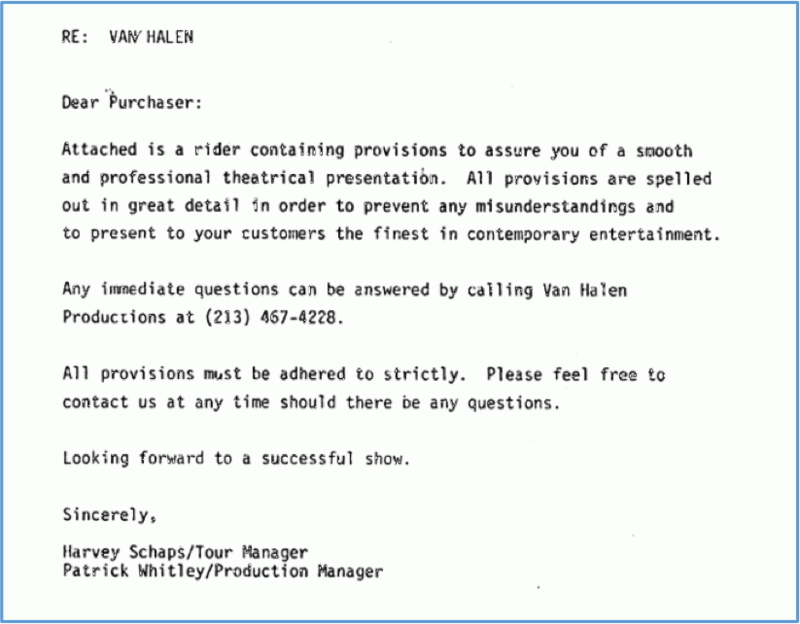 The requirements in the Rider, attached to the contract, were quite explicit: As lead singer David Lee Roth explained in a 2012 interview, the bowl of M&Ms indicated to him whether concert promoters had actually read the band’s complicated contract. “Van Halen was the first to take 850 par lamp lights — huge lights — around the country,” Roth said. “At the time, it was the biggest production ever.” In many cases, outdated venues were inadequately prepared to set up the band’s sophisticated stage. “If I came backstage, having been one of the architects of this lighting and staging design, and I didn’t see brown M&Ms on the catering table, then it guaranteed the promoter had not read the contract rider, and we would have to do a serious line check” of the entire stage setup, Roth said. 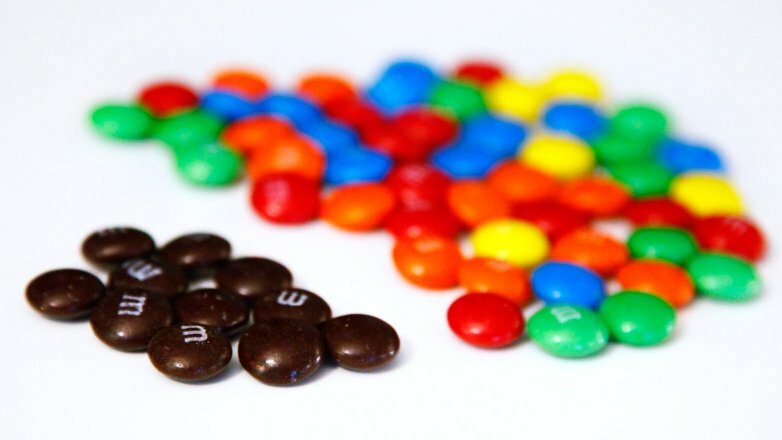 A System of Brown M&Ms. The idea deployed by Roth is akin to Trim Tab Theory. Trim tabs are small surfaces connected to the trailing edge of the larger rudder on a boat or aircraft, to counteract hydro- or aerodynamic forces and stabilize the boat or aircraft in a desired altitude or direction without the need to constantly apply a control force. A small effort, adjusting the angle of the tab relative to the larger surface, shifts the larger direction. To be clear, if we view ourselves as co-creators of our lives rather than at the effect of circumstances, then the way we observe and prioritize small details positions us to leverage the seemingly trivial with minimal effort to impact significant changes. We live in a Trim Tab world — a time of Chaos Theory or The Butterfly Effect — a system of brown M&Ms. Small fulcrums, leverage points, or trim tabs – details that cut through the noise and distractions — can offer incredible clues. Paying attention to these signs often effects significant change or provides clarity to engage what matters most. When is a Project More Than a Project? Years ago, I read a case about a new CEO taking over a company that had become complacent. His first priority: to bring in fresh blood. But how would he determine who to keep and who to dismiss? He needed to act in his first weeks to right the direction of the company. The CEO emailed all his VPs, detailing a task he requested due in two weeks. In truth, the project took about half-a-day to complete. The VPs fell into four groups: Some VPs completed the task in a couple of days (group 1), some completed before the due date (group 2) others completed it on the due date (group 3), and the rest were late with some explanation (group 4). The new CEO fired those in groups 3 and 4 and kept anyone who was early (groups 1 and 2). He reckoned that the complacency at the company had come from a lack of urgency that had set into his senior team. He opted not to manage this issue, but rather honor those VPs who could pull themselves together and create urgency for this request. Brown M&Ms in The Details of Life. What do you pay attention to? Will you miss that request or detail, causing you a future promotion, business opportunity, or important invitation? How we leverage details can come to define us: about what we notice, what we miss, and how we prioritize choices. Online Presence. Begin with your online presence. Snarky comments, crude tweets or obscene photos posted on Monday can get you fired by Friday. Inspect your online presence with this rule in mind: how would that look on the front page of the New York Times. Writing Material. HR managers and supervisors seldom tolerate spelling mistakes or typos on a resume or cover letter. A simple professional proofread is all it takes to fix them. Use the four-eye rule: Do not let any written material represent you until it’s been read by four eyes (your two, and one other pair). Reading Material. When reviewing email or other written documents look for numbers and time-metrics (days, months, noon, etc.) to prioritize items. These “metrics” represent a higher level of intention – details that reveal accountabilities and are often urgent and closer to action. Which of these requests would stand out among several paragraphs in an email or document? Which of them would be acted on? I am behind in my work and really could use some support soon. I am behind in my work and need 2 staff members by Friday, July 1. A detailed person often expects detailed attention. Scanning communications for numbers and days will help you highlight what’s important, reprioritize your time, and act on, manage, or negotiate requests before it is too late. Pause before choosing. Possibly the most critical life trim tab today, an infinitesimal small item that has a profound impact, is a simple pause before choosing to speak or act. Pausing can save us from ourselves and our fatal flaws. There are a couple of approaches to pausing. Before entering a new event (meeting, conversation, activity) pause, feel the ground beneath your feet, clear the mind, and enter the event open and available. Before speaking or acting, pause, take two or three deep breaths and ask: Why am I (in this conversation, responding to this email, etc. ), then refocus on the matter at hand? These little details may seem trivial, but as Van Halen demonstrates, they can be life and death. Develop your own brown M&M’s system that keeps you aware of all of the little details that define you in a big way.